Epiphone Viola Bass. It is an amazing little bass and the short scale neck always worked for the type of music that I was playing at the time (either Brit Pop or Post-Punk). But as time went on, I started to realize the limitations of having a four stringed bass. After spending some time seeing bands play in Nashville, I noticed that the five-string bass was the most common bass to be playing. Session musician after session musician would bring a five-string on stage and I noticed there were reasons for this. 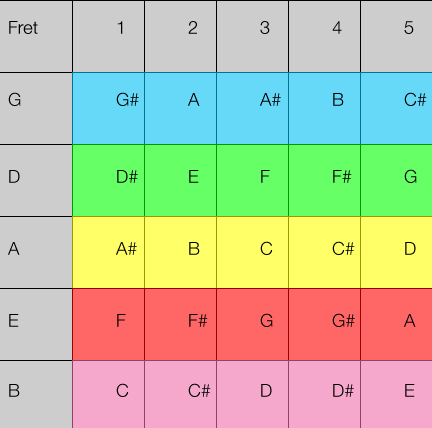 On a typical four-string bass, we only go as low as that E that is at the bottom, so that when staying in first position (the first few notes), the lowest of low notes that can be hit is the E. With the introduction of the fifth string, the lowest note is now a B which allows for an easy follow up into the E on the fifth fret (which translates over to our normal low E string). Watch this in action in a video that we did with a group of students at USC, Marjorie by Brett Fromson and The Monday Night Boys Club . See how the bassist is able to stay in one position and clearly make a sonic mark in the song by hitting super low notes to match the kick while being able to do runs up and down the neck without having to get into the more treble-y 12th fret range? That is the advantage of the low B string on the bass. For session work, this is necessary. If an artist comes in with a song that is drop-tuned or requires a deeper sound that a typical song, the five-string allows the bassist to be ready to play right away, versus the four-string bassist having to retune. As any studio should, we have a selection of basses to deal with any need for any song. To make sure that we are ready, we got the Gibson Tobais Growler bass as our five-string. The pick-up controls allow us for quite a few different tone choices as well, though I think the round-low bottom end is really where it is at for this bass. Next entry: Learn About It, Guitar!